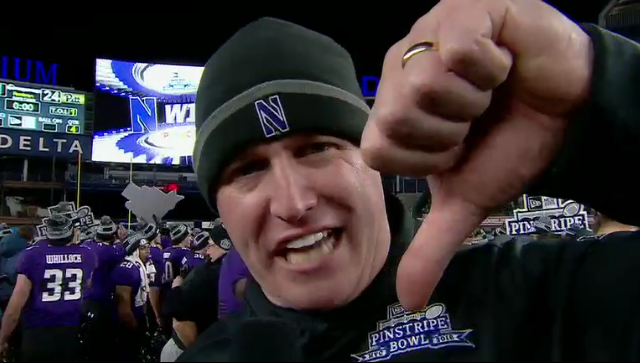 Playing in a bowl game with a 6-6 record, there weren’t many on chips on Northwestern’s shoulder. At that point, you’re more or less just happy to play another game. But ESPN analyst Danny Kanell gave the Wildcats some extra motivation by basically guaranteeing on national television that Pittsburgh would beat Northwestern in the Pinstripe Bowl on Wednesday. Kanell put 40 confidence points on Pittsburgh to win the game. Well, Fitzgerald showed Kanell’s pick to the team before kickoff, and Northwestern proceeded to upset Pitt 31-24 at Yankee Stadium. Kanell gave credit where credit’s due after the Wildcats held off the Panthers. With a touchdown lead late in the fourth quarter, Northwestern forced an interception at the goal line and then another pick with less than two minutes left to seal the game. Bowls are pretty meaningless, but Northwestern now has two bowl victories in 11 years under Fitzgerald, more than the program had in its entire history before he became head coach. That’s got to be worth something, right?